Last night, ABC’s venerable sitcom, According to Jim, signed off after eight seasons and 182 episodes. The show has been performing poorly in the ratings for quite awhile but ABC just kept on bringing it back. The reason? Well, sitcoms perform well in syndication. So, even though Jim wasn’t doing well in primetime, ABC Studios more than recoups the expenses when the episodes are rerun on cable and local stations. Similar economics have saved Scrubs. All things must come to an end though and season eight is the end for Jim. 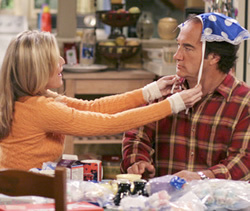 Though ABC maintained that the sitcom could return for season nine, co-star Larry Joe Campbell revealed in December that the show’s sets had already been destroyed. Last month, the network conceded that Jim was indeed finished. In the series finale, titled “Heaven Opposed to Hell,” Dana (Kimberly Williams-Paisley) and Ryan (Mitch Rouse) return from California for a visit and announce that they’re expecting. Andy (Campbell) and Mandy (Jackie Debatin) also announce that they’re engaged. Jim couldn’t care less and then, while everyone else is congratulating the happy couples, he chokes on a shrimp puff. Everything goes white. Jim then finds himself walking along in the clouds. He runs into Danny Michalski (Dan Aykroyd) on a motorcycle who tells Jim that they’re both dead. Jim almost gets into heaven but is stopped at the last minutes. He must first go on trial to prove that he’s worthy. God is played by Lee Majors while Satan is portrayed by Erik Estrada. Did Jim stay on the air too long? With Andy as his defense attorney and Dana as the prosecuting lawyer, Jim goes on trial. Through clips, we’re reminded about Jim’s character. His children (Taylor Atelian, Billi Bruno, and Conner Rayburn) testify for him, as does his wife Cheryl (Courtney Thorne-Smith). Unfortunately, it’s not enough. Just when it looks like all is lost, his family and friend tell God that, if he’s sent to Hell, they love Jim enough to go with him. The almighty has no choice but send him back to Earth. But Jim reasons that it’s his personality that saved him so he should never change a thing. After all, “God don’t want me. The Devil don’t want me. The way I figure it, if I never change, I’ll live forever.” He tosses another shrimp puff in the air and, just as he’s about to catch it in his mouth, the screen goes black. End of series. Some feel that the sitcom had long overstayed its welcome. Some devoted fans are sorry to see it go. What do you think? Either way, was this a fitting series finale? The poll says that 68% of people think the show was killed too soon, but honestly, the majority of traffic this page received was likely the dedicated fan base, who posses a clear bias. Loved the show though, had some hammy acting, but over all: it makes me happy and feel good, isn’t that really all that matters? I was sad that it ended just after the twins were born! I loved that show & all the characters! I really love the serie. It was one of my moment of the week. I am a bit sad about its stop. It’s too bad a good show like George Lopez was cancelled fairly early while “According to Jim” had lousy ratings 6 of its 8 years and ABC kept bringing it back. Belushi must have had something on someone at ABC! I love According To Jim!! I’m so sad to find out it’s off the air! I’ve been watching re-runs on FOX for like the past 6 months and fell in love with it. I just went online to find out what day/time/channel new episodes were on and I was so sad to see that it’s been canceled for over 3 years :-). Well I’ll just have to go buy each season on DVD or look for it on NETFLIX.